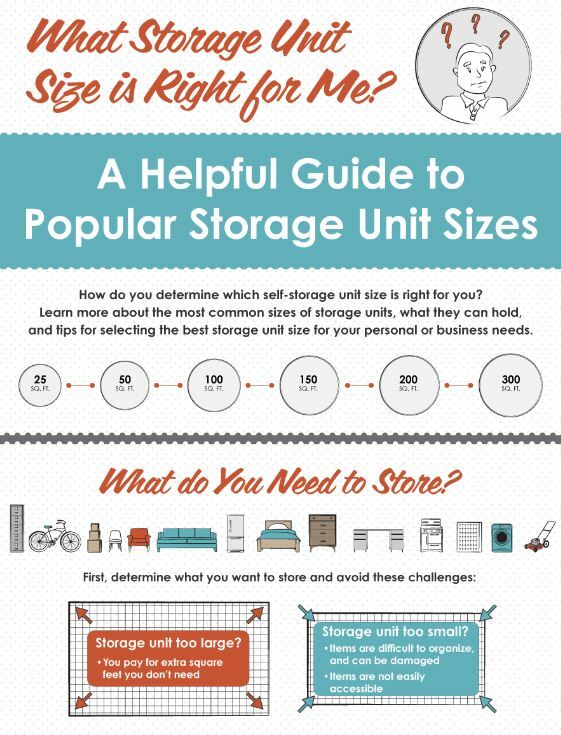 What’s the Right Storage Unit for You? No one wants to end up with a storage unit that is too small to fit their belongings. However, it’s a common issue. The reason this happens is pretty easy to explain. No one wants to pay more than they need to for their rental storage. Unfortunately, choosing a unit that is too small means that you may have to get rid of things in a rush because you run out of time to move things to a larger unit. When you need to figure out what size storage unit to get, there are two things you can do that will help a lot. The first recommendation is to make a list, and the second is to measure well. 5X5: This smallest unit is about the size of a large closet at home. It will fit a dresser or a twin mattress and some boxes. The space, which is 25 square feet, will hold what typically fits in a garden shed or a small van. It works well for some small furniture items, boxes or totes of seasonal items, and business supplies. 5X10: The next size up, which is 50 square feet, will hold the contents of a small studio apartment or a dorm room. Larger furniture (such as a queen size bed) and larger appliances will fit. Plus, there is space for boxes or totes of household goods, business supplies, seasonal items, and sports gear. There is room for a bike or motorcycle as well. 5X10: Some of our locations offer a mid-range rental storage space between a 5X10 and a 10X10 size. This 7.5X10 space will hold all that a 5X10 will hold, with room to spare for extra boxes, equipment, or supplies. If you are thinking a 5X10 is going to be cutting it close for what you have, go with this mid-range size just to be safe. 10X10: This 100 square foot size will hold the furniture and belongings from a full living room and two bedrooms. It’s what you would need to hold all the contents of a full garage or a small apartment. It will hold large furniture items (like an entertainment center), and it’s a good size for storing a jet ski, a small trailer, or a motorcycle. 10X15: The 150 square foot spaces will hold the contents from a small house with three bedrooms. Large-screen TVs, multiple-piece sofas, full dining sets, and king size beds fit in this space. It fits larger sports equipment, such as kayaks, scooters, and large motorcycles. In these larger spaces, it’s important to make sure that items you need first or often be either towards the front or close to an open walkway through the boxes. 10X20: These spaces are the equivalent of having a one-car garage entirely for storage. The contents of a large house or office space will fit in this 200 square foot area. Regular-sized vehicles, including boats, will fit with plenty of room around them to store boxes and equipment. 10X30: Many of our locations also offer 300 square foot spaces. This is the size of a long one-car garage. The contents of a large house (4+ bedrooms) and a full garage will fit. It will hold what would require three loads from the typical moving van. Parking: If you need to store family cars, work trucks, or recreational vehicles, Bargain Storage self-storage rentals also include parking spaces. These range in size from a 10X20 for regular-sized family car to 11X40 for a large RV. When possible, you will want to visit the location of your potential rental storage to get an idea of other aspects of the storage experience, such as the cleanliness of the location and the helpfulness of the staff. We invite you to visit our locations any time – we’re happy to assist! We offer storage units across the country for any needs you have. Please feel free to contact our helpful team members to learn how we can help make your storage experience a breeze!